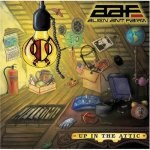 Up in the Attic is the sound of a band losing its identity in the transition from silly jokers to serious artists. Major label album #1 was a fluke hit, spurred by a Michael Jackson cover and Oompa Loompas. Major label album #2 was a surprisingly lucid, serious, and strong followup, emotionally bolstered by the horrific bus accident that preceded its recording. So where does that leave major label album #3? Unfortunately (or, fortunately, depending on how you look at it), save for some record company shenanigans and a switchover in guitarists, Alien Ant Farm's major label album #3 is gimmickless, hookless, and largely motivationless. Still, even without any of those things, the Farm still knows how to write a pretty decent rock 'n roll tune. Up in the Attic is the name of the new album, and to be fair, it's really more like major label album #3.5 -- at one point, an album called 3rd Draft had been created, which then sat in Geffen's meat locker for about a year while the band distributed it freely in protest, which then finally convinced Geffen to throw their hands up in the air and say "fine, whatever, release the damn album, just do it on this other UMG subsidiary". And thus, Up in the Attic was born, complete with one extra track, which just happens to be the big hit single. Wait... did I say "big hit" single? My apologies, I must be flashing back to 2001, the last time these guys could really be accused of releasing anything with the qualifier of "big hit". So far, that new song, "Forgive & Forget", hasn't really changed that trend, but there's still time, right? Well, probably not -- there's nothing on "Forgive & Forget" that makes it sound all that different from any other bad-breakup anthem that might be on the radio right now, except that it's a little bit crisper and punkier than much of the sludge on rock radio these days. You can sing along with the chorus, and it sounds nice, but it's not all that catchy, and certainly won't have anyone rushing out to buy the album. A much better candidate for the big hit single is the more acoustically-based "Crickets", which owes more than a little bit to country music, given its chord progressions and clean electric guitar soloing. It even contains some nice, wistful attempts at romanticism in vocalist Dryden Mitchell's lyrics: "I would just lay in the mustard seed / And watch you climb the trees / Look for fool's gold in the scary creek / Splash you cold and make you scream" is just the sort of nicely simplistic sentiment that the overstimulated new entrants to the work force (that is, the 25-year-olds who enjoyed Alien Ant Farm the first time around) can find solace in. "San Sebastian" features copious cowbell (which has come right around from cool to cheesy to ironic and right back to cool again) and the catchiest chorus on the album, and "Lord Knows" tosses some trumpets into the mix for good measure, adding to the sense that Alien Ant Farm is at least trying to add a little bit of sonic variety to the album. As happens so often with bands trying to score another hit while maintaining whatever credibility they may once have had, Alien Ant Farm's biggest problem on Up in the Attic is their failure to commit -- they don't want to seem soft, so they never quite give in to their pop leanings, but they want to appeal to as many people as possible, so they definitely don't thrash around with the wild abandon of their younger days, either. Tracks like "Getting Closer" and "Consti2tion" give us universal sentiments like the fear of getting older and the desire for something to live for, but they do it with trips into flaccid New Found Glory-type pop-punk and half-baked turns at ska. Granted, Mitchell has a unique, appealing voice, drummer Mike Cosgrove is an undeniable talent, and the band sounds tight, but without memorable tracks that really take off, all of their positive traits are all but wasted. The end of Up in the Attic takes Alien Ant Farm to a different place. "Sleepwalker" adds some drama via strings, and "She's Only Evil" adds pianos, more strings, and lots of hand-played percussion to take the band in a darker, more gothic direction, something that might have been welcomed for the rest of the album. As it is, however, the change in style is just one more dart at a seriously cluttered board. Up in the Attic sees Alien Ant Farm in transition, trying to mold its identity from sophomoric silly rockers to more serious artists. For now, the transition doesn't mold that identity so much as it loses it altogether.